Halo semua…!! Apa kabar semua? I hope everything is fine. Nowadays, I always thinking about Indonesia. So..today we want to share another Indonesian food. The base of this dish is Prawn. Prawn is high in levels of omega-3s, low in levels of mercury, high in calcium, iodine, and protein but low in food energy. 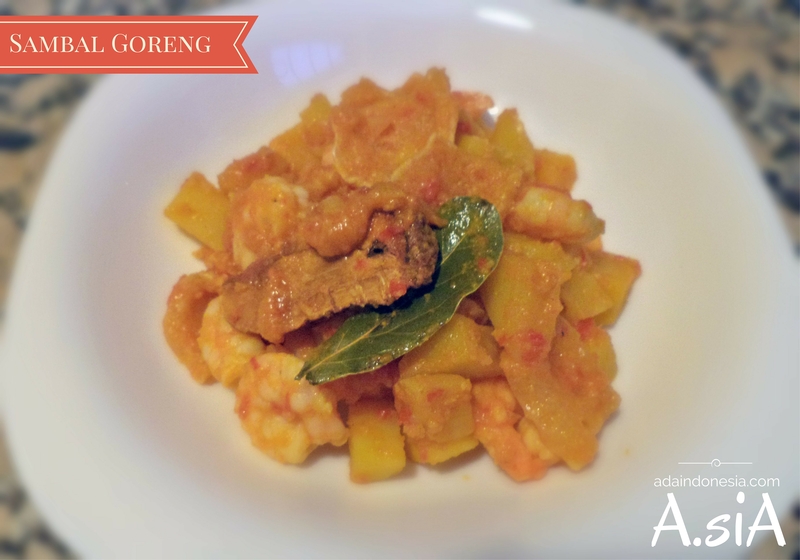 The name of the dish is Sambal Goreng Udang. Sambal Goreng Udang is also known as Udang Balado. It is made of shrimp cooked in rich, hot and spicy balado or sambal (chilli pepper sauce). Commonly known in Minangkabau cuisine of West Sumatra. It’s quite famous in Indonesia, not only because it’s delicious but also because it’s spicy. Hmmm…yummie! But don’t worry if you don’t really like spicy you can put less chili, anyway it will be still delicious. Grind all the ingredients of the paste with food processor or mortal & pestle until smooth. Peel and clean the prawn, potatoes, then cut the potatoes into cubes. Heat a pan and saute the paste with bay leave and galangal until perfume. Throw the potatoes into the pan, and add tamarind water and little bit of water. Cook until the potatoes are tender and add prawns and skin crackers. Season with salt and sugar. Continue cooking for about 5 minutes. It’s ready to serve with hot steam rice. Don’t forget to clean the back of the prawn, & don’t cook the prawn so long, because it will make the texture of the prawn hard and dry.Thank you for visiting our website. We love to hear from you, so please leave your comment down bellow.